Conspicuous, wetland-dwelling herald of spring. Abundant throughout the US year- round and into Canada in summer. Prefers wetlands; also in open areas and feeders in winter and migration; may form large mixed flocks in winter. Sleek, all black, with variable red and yellow shoulder patch; female plumage streaked brown and sparrow- like; conical bill. 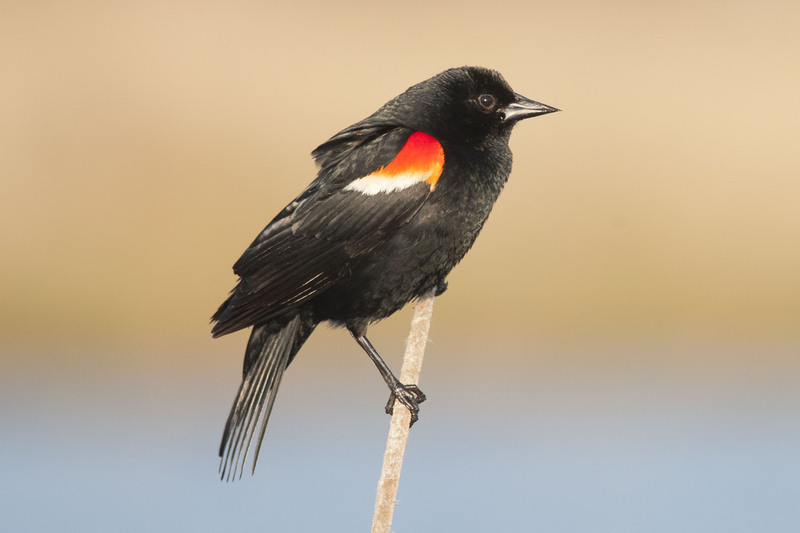 Spring males sing territorial “conk-a-ree” song throughout the day. Diet mainly insects in summer, seeds in winter. Nests polygamously, with males having up to 15 female partners; typically build nests in low marsh vegetation. Lifespan up to 15 years. Population ~ 190 million and stable.